菅野, 伊藤, 高村, 入力文書の印象と感情に基づく楽曲提供の一手法, 情報処理学会第105回音楽情報科学研究会, MUS105-4, 2014. 清水, 菅野, 伊藤, 嵯峨山, 高塚, 動画特徴量からの印象推定に基づく動画BGMの自動素材選出, 情報処理学会第114回音楽情報科学研究会, MUS-114-17, 2017. 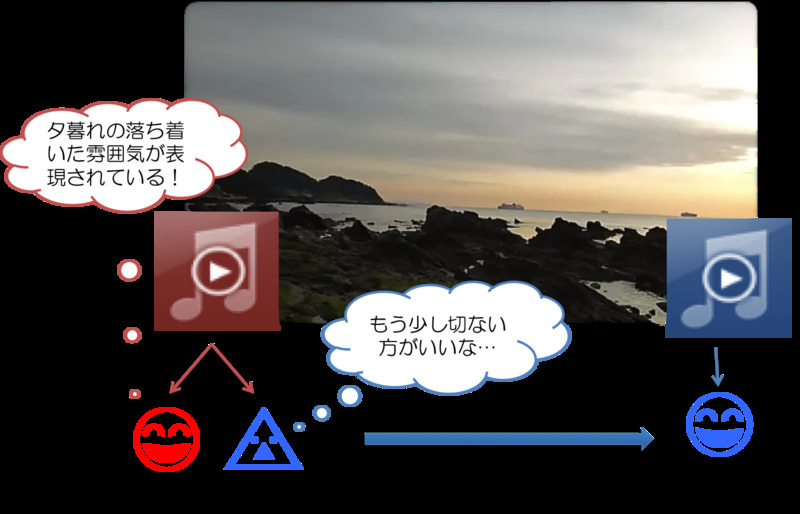 W. Machida, T. Itoh, Lyricon: A Visual Music Selection Interface Featuring Multiple Icons, 15th International Conference on Information Visualization (IV2011), 2011. A. Hayashi, T. Itoh, M. Matsubara, Colorscore - Visualization and Condensation of Structure of Classical Music, 15th International Conference on Information Visualization (IV2011), 2011. S. Nagatsu, T. Itoh, RoughNote: A Single-Tone-Note-Like Visual Representation of Classical Music, NICOHRAPH International 2011, 2011. 斉藤, 伊藤, MusiCube:特徴量空間における対話型進化計算を用いた楽曲提示 インタフェース , 2011年度人工知能学会全国大会, 2011. 長澤, 渡辺, 伊藤, Web から入手したデータに基づくコード進行を利用した楽曲類似度の提案と楽曲視聴支援システムの開発, 電子情報通信学会データ工学ワークショップ(DEWS2008), 2008.
copyright 2010 Itoh Laboratory All Rights Reserved.